" . . . compassionate and committed . . . "
The client's independence, quality of life and happiness are, truly, Dragonmobility's primary goal. I know this first hand because last summer, my wife and I and our three-year old son, Charlie, traveled to England from California to get him a SnapDragon. 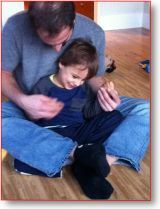 Charlie suffered a brain injury during his birthing process, leaving him with cerebral palsy. When he reached the age of three, Charlie was quickly becoming too big to be carried around by my wife and myself. After months of thorough research, we decided that this little company in Cambridge made the best mobility device available today. We spent two weeks in England so that Charlie's chair could be custom fit and to learn how to use and maintain his SnapDragon. Though we learned an incredible amount about our son's new, life-changing device, the most indelible memories of our trans-Atlantic journey are of the Everards, themselves. Dan, Lou, Ruth and Alice are quite possibly the most compassionate and committed family I have ever met. The integrity of their character, as individuals, and as a family, was compelling, and made our trip nothing short of magical. Their passion for their work came through in every sentence spoke, and after spending the better part of two weeks with their family in varying capacities, I can honestly say that they will be life-long friends and people who I will admire always.